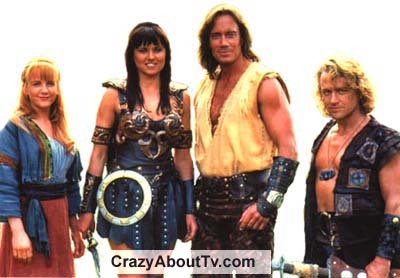 Xena Warrior Princess was a 60 minute fantasy series that aired in syndication. It is a "spinoff series" of "Hercules: The Legendary Journeys". It was about a former evil female warlord who had ravaged the Greek countryside who came to regret what she had done and vowed to make up for it by defending the innocent against evil forces. "In time of ancient Gods, Warlords and Kings, a land in turmoil cried out for a hero. She was Xena, a mighty princess forged in the heat of battle. The power. The passion. The danger. Her courage will change the world." Xena's companion Gabrielle began the series as a naive farm girl but soon evolved into a formidable warrior. She maintained some of her innocence however and thus helped Xena to stay focused on protecting those in need. Back in her evil warlord days, Xena had been the arch enemy of Hercules. On the eighth of October in 1996, Lucy Lawless broke her pelvis while rehearsing a skit for "The Tonight Show". That caused several episodes of season two of Xena to be rewritten and even a few brand new ones written while she recovered. Fortunately, Lucy was feeling good enough to talk to Jay Leno about the accident on the October 30, 1996 episode of the Tonight Show! Callisto was one of Xena's most formidable enemies. She held Xena responsible for the death of her family when her village was burnt to the ground! Actress Vanessa Angel ("Weird Science") was originally cast in the role as Xena the Warrior Princess but she got very sick right as filming began for the introductory episodes on Hercules: The Legendary Journeys. She couldn't make the flight to New Zealand for filming and lucky Lucy Lawless got the role! Renee O'Connor did most of her own stunts. In the sixth season episode titled, "The Abyss" she kicked a cannibal in his face halfway through performing a back flip and that was done entirely without the aide of any wires or other special effects! Starting with episode three of the third season, Xena Warrior Princess was filmed in widescreen mode. Before that it was filmed in the old 4:3 ratio screen. All Xena fans know that the relationship between Xena and Gabrielle was a very close one and a loving one. There has been an ongoing controversy about whether they were just extremely close friends or whether they may have had a lesbian relationship. While there was no conclusive proof either way in any of the episodes, Lucy Lawless herself said that she feels that the relationship was a romantic one. Thank you for visiting our Xena Warrior Princess page!